WE UNDERSTAND THAT THE NEWS sometimes covers stories about dentists who endanger their patients with improper sterilization practices. We know that such stories can be scary and that’s why we wanted to declare that with us, you don’t need to worry. Every time you come to our dental practice you can be confident that you’re in good hands. We hold ourselves to the highest standards of cleanliness because we value your health and safety. For us, dentistry is about more than beautiful teeth—it’s about life-long well being. A clean examination space, free from any possible infections from a previous patient. 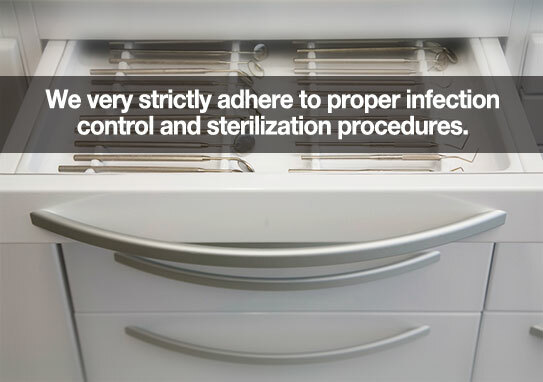 Thoroughly sterilized instruments, packaged and protected just for you. Treatment from healthy team members who follow strict personal cleanliness standards and wear appropriate personal protection equipment like gloves and masks. We use an ultrasonic machine and disinfectant to remove any debris from our instruments. We package all instruments & sterilize them in an autoclave and safely store them for your visit. We run backup tests weekly and monthly on our autoclaves for extra protection. We are constantly reviewing the literature for any updates or new products. We have monthly and yearly classes on the latest sterilization techniques. Please, if you have any questions or concerns, ask us! Ask to see our safety accreditation, ask about the sterilization process that all our tools undergo, ask what we do to ensure that every surface in our office is clean and safe. We want to be completely transparent about our infection control procedures so that you can feel totally safe and confident in the dental chair. We understand that it takes trust to put yourself in our hands and we take pride in proving ourselves worthy of that trust. You can read more about infection control in the dental office from the ADA here.